Here is our PDF bundle that includes the Clark GPX25E forklift repair manual you need (PDF formats). It is the forklift repair documentation and service instructions for your trucks from Clark. 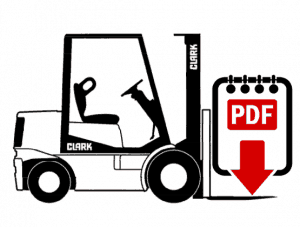 This Clark GPX25E repair manual contains information that you need for your fork truck equipment. Get this Clark GPX25E forklift repair manual as a PDF. PDF files can be read on mobile devices such as iPhones, Android smartphones, tablets and desktop and laptop computers that run Windows software as well as the MacOS operating system. Need something other than the Clark GPX25E forklift manual? Then ask us here: Find a manual.